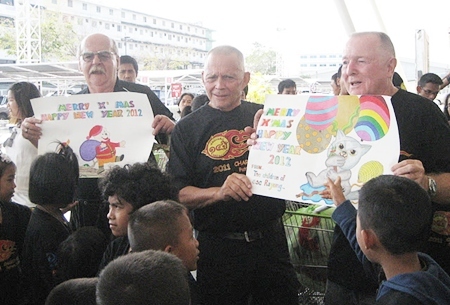 On December 18, members of the Canadian Jackalope Open and the Jesters Care For Kids arrived at the Camillian Center for the annual children’s Christmas shopping trip to Big C in Rayong. 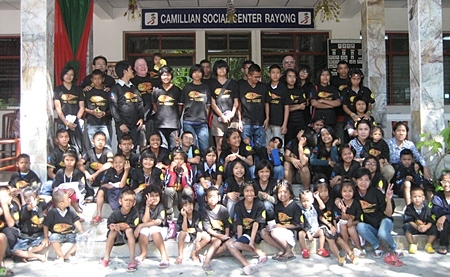 After a quick lunch, Bill Freeman and Erle Kershaw distributed Care for Kids t-shirts to all the children at the center, then it was off to Big C.
Upon arrival at the main entrance, the Camillian Center staff took charge of the group of 80 children to give them their instructions and directions. 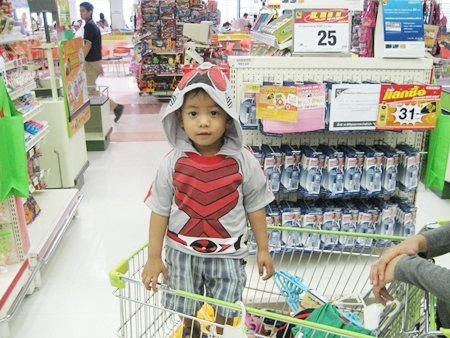 After an hour and a half, the shopping was done and it was time for the Big C staff to total up all the individual purchases and final tally. 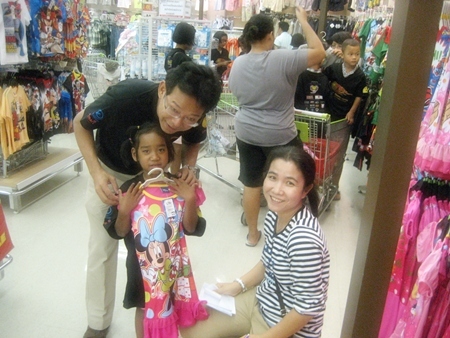 This year 64,980 baht was spent, with plenty of happy faces on all the kids. (L to R) Wayne Ogonoski, Bill Freeman and Erle Kershaw from the Jackalope Open and Jesters Care for Kids. 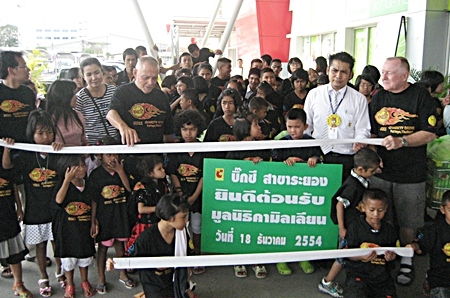 We would like to thank the management and staff at Big C in Rayong for all their help in making this another memorable day out for the children. Finally, thanks to all the staff at the Camillian Center for once again planning and organizing not only this shopping trip, but all outings that the Canadian Jackalope Open and Jesters Care For Kids provide for them. Erle Kershaw helps this little one pick out a dress. Look at me, I’m King of the World. This youngster is excited to be given a beautiful Minnie Mouse dress. Trying to assemble this many children for a group photo handling the lengthy store receipt is no small task. The large crew readies to head out for a day of shopping.